A popular workplace trend -- working remotely -- made the headlines after Yahoo's CEO required the company's remote workers to return to the office. The company made the point that employees working from home have fewer chances to collaborate with coworkers. While not all companies allow employees to work off-site, new data from Gallup's State of the American Workplace report shows that that nearly four in 10 (39%) of the employees surveyed spend some amount of time working remotely or in locations apart from their coworkers. And, Gallup finds that companies that offer the opportunity to work remotely might have some advantages when it comes to hours worked and employee engagement. Remote workers log more hours. Although they may not always have a manager nearby to monitor their productivity, remote workers log more hours at their primary job than do their counterparts who work on-site. Remote workers log an average of four more hours per week than their on-site counterparts. Remote workers are slightly more engaged -- to an extent. Despite working longer hours, working remotely seems to have a slightly positive effect on workers' employee engagement levels. Gallup found that these workers are slightly more engaged (32%) than employees who work on-site (28%). However, there is a point of diminishing returns for engaging remote workers. 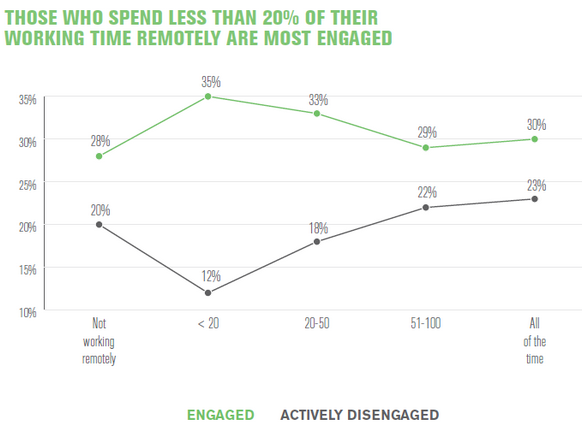 Those who spend less than 20% of their time working remotely are the most engaged, at 35%, and they have the lowest active disengagement, at 12%. These employees likely enjoy an ideal balance of both worlds -- the opportunities for collaboration and camaraderie with coworkers at the office and the relative sense of freedom that comes from working remotely. By contrast, those who spend more than half of their time or all of their time working remotely have similar engagement to employees who do not work remotely. Remote workers may feel more connected to their companies. Remote workers score higher than on-site workers do on the "opinions seem to count" and "mission and purpose" items on Gallup's Q12 engagement survey, which are typically associated with a sense of belonging. This seems to indicate that remote workers may feel more connected to their companies, despite the physical distance between themselves and their workplace and colleagues. For additional employee engagement insights for U.S. business leaders, read the full report and follow the conversation on Twitter using #EmployeeEngagement.